If you’re reading this article, I’m assuming you have already made the decision to open a business in Indonesia. There are many compelling reasons to launch a business in Indonesia, but we won’t go into those reasons here, this piece is geared towards foreigners who have decided that they want to launch a business in Indonesia and are now trying to figure out the best way to do so. A representative office (Rep Office) is a local entity that acts as a representative or branch office of an existing foreign entity. The Rep Office is limited in what it can do in Indonesia, the biggest of which is that it cannot participate in any revenue generating activity, but only in revenue sourcing activity. The distinction between revenue sourcing and revenue generating is a subtle but important one. Revenue sourcing is defined as any effort (typically marketing) to solicit revenue on behalf of the parent company with clients. Revenue generating activities, on the other hand, are defined as any activities that constitute the actual work that the would-be clients are paying for. Every Rep. Office must have a Chief Representative Officer (“CRO”) that is appointed by the Parent Company. The CRO can be an Indonesian or foreign passport holder. The CRO cannot be the CEO of the Parent Company. 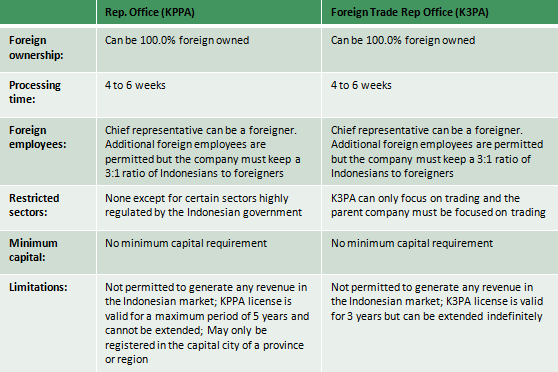 In Indonesia there are two types of Rep. Offices, a regular Representative Office (“KPPA”) and a Foreign Trade Representative Office (“K3PA”). These two types of Rep. Offices are almost identical except for the fact that the K3PA can only focus on trading (and the associated Parent company must focus on trading as well), while the KPPA can participate in practically any industry. Permits for a KPPA are granted on a yearly basis and can be renewed for 5 consecutive years after which point the permit may not be renewed. A K3PA’s permit is granted for a 3-year period and may be renewed indefinitely. A software company called XYZ based in Singapore sets up a Rep. Office in Indonesia called XYZ Indonesia. XYZ Indonesia staff can help win business for XYZ Singapore from Indonesian clients (Revenue sourcing), however XYZ Indonesia staff cannot perform the underlying work that the Indonesian clients are paying for (Revenue generating). Participate in any revenue generating activity in Indonesia. Once the ParentCo deed, the LOI, LOA, and Statement letter are notarized and legalized they must be submitted to the BKPM for approval. Once the BKPM approval is received, the Rep Office can apply for its Tax ID number, Domisile Certificate, Business Identification Number (TDP), Social security registration (BPJS), and ministry of manpower registration (WLK). Rep. Offices can only be formed in the capital city of a province or region. Furthermore the Rep. Office may sponsor other expatriate workers, however a ratio of 3 local employees to 1 foreign employee must be maintained. Often the biggest hurdle for foreign investors in setting up a PT PMA is the large paid up capital requirement of IDR 2,500,000,000 that must be legally committed to set up the company. Foreign owned businesses must also conform to the restrictions of the Indonesian government’s Negative Investment List (DNI) that sets limits on the foreign ownership of businesses according to their business lines (KBLI). These restrictions range from business lines which are completely closed to foreigners (0.0% foreign ownership) to those which are 100.0% open. In every other way however, the PT PMA is identical to the locally held company structure (PT PMDN). It is subject to the same taxes, the same laws and regulations (unless it operates in specific highly regulated sectors)and can also sponsor expatriate work permits (subject to a foreign hire to local hire ratio of 1:10). The Indonesian government’s latest negative investment list can be found here. Note that many businesses often do not strictly conform to the business lines mentioned in the DNI; in this event investors can set up an appointment at BKPM (the Indonesian Investment Coordination Board) to consult with BKPM staff to identify the appropriate business line and applicable foreign ownership restrictions. In lieu of visiting BKPM, local advisors and consultants can also be hired to do this on investors’ behalf. Authorized signatories of the foreign legal entity will need to sign the deed of the Indonesian company in person, if an existing authorized signatory is unable to do so then a power of attorney ("POA") must be granted from the directors of the foreign legal entity to an appointed signatory in Indonesia who will sign the deed on the foreign legal entity's behalf. If a POA is made it must be notarized and legalized as well. Name of the company: Must be 3 words long, foreign words permitted. Paid up capital and authorized capital amount (minimum paid up capital of IDR 2,500,000,000, and must be at least 25.0% of authorized capital). The company needs a minimum of 1 director (can be foreign or local), as well as one commissioner, for both these individuals a copy of their passport will be required. Director does not need to be a shareholder. Note virtual offices cannot be used for a PMA, at the minimum the PMA company must have secured a dedicated desk at a coworking space. Unlike local Indonesian companies which may register for multiple KBLIs (i.e. multiple business lines) in their articles of incorporation, a PT PMA is restricted to one business line only unless it invests an additional IDR 2,500,000,000 in paid up capital per new business line. If a PT PMA has registered for multiple business lines the restrictions of the more restrictive business line will apply to the entire company. For instance, if a company registers for two KBLI’s, one of which provides 100.0% foreign ownership and the other which provides 67.0% foreign ownership, the company will be restricted to 67.0% foreign ownership (based on the more restrictive KBLI). For expatriates who are unable to open a PT PMA due to either the high paid up capital requirement or the foreign ownership restrictions, an alternative is to operate a locally held company (PT PMDN) using nominee shareholders. It is important to understand that the Indonesian government does not recognize the legality of nominee agreements in Indonesia. While nominee agreements are not illegal outright, the government and courts of Indonesia will not recognize the validity of these agreements if held in question. In the eyes of the (Indonesian) law, it is the nominee shareholders who are the valid and rightful owners of a nominee held company, not the beneficial owners. While a nominee structure is therefore inherently risky, there are tools available to investors to try and mitigate risk. The most obvious way to minimize risk is for investors to work with Indonesian nominee shareholders that they have a strong trustworthy pre-existing relationship with. Many foreign investors who have Indonesian spouses or extended family often choose to name these individuals as nominee shareholders as a result. Of course, the vast majority of investors who choose to do business in Indonesia wont’ have access to local individuals or entities that they trust. In this case we recommend investors to work with reputed corporate services providers such as ourselves. Corporate service providers guarantee a high level of trust and professionalism, and act as disinterested parties who do not get involved in the day to day operations of the companies that they act as nominees for. When working with nominee shareholders, investors can enter into a series of agreements with their nominee shareholders to mitigate risk. The primary structure through which an investor can secure his or her investment into a nominee held company is by putting in place a loan agreement between him or her and the nominees equivalent in principal value to the amount that is being invested.This loan agreement is legal and valid in Indonesia, and the agreement can be used by the investor to recover the principal value of the investment in the event of a conflict with the nominee shareholders. In addition to the loan agreement, other documents also need to be executed to fully protect both the investor and the nominees. The full list of required documents which Permitindo recommends is included in Fig 2 below. This process is straightforward however it requires the cooperation of all parties involved. All parties must act in a timely matter so as not to delay this process unnecessarily. Perhaps the biggest issue to consider when setting up a nominee held company is in determining how to effectively repatriate funds to the beneficial owner / investor. A dividend that is issued to the nominee shareholders which is then transferred to the beneficial owner is one potential mechanism but one that is highly tax inefficient as taxes will be paid at the corporate level, prior to the distribution of dividends, at the nominee shareholder level, in the form of dividend taxes, and at the beneficial owner level, as withholding taxes may be applied when the nominee shareholder transfers the funds. A more tax efficient way to proceed would be to establish a contract between the investor and the nominee held company whereby funds are transferred to the investor to pay for management fees, license fees, or even perhaps royalty fees. It is critical that this type of contract is based on a valid business relationship to avoid any scrutiny from the relevant tax authorities. Permitindo recommends that its’ clients consider the question of how to most effectively repatriate proceeds in detail with an advisor prior to establishing a nominee held entity in Indonesia. Authorized signatories of the legal entity will need to sign the deed in person, if an existing authorized signatory is unable to do so then a power of attorney ("POA") must be granted from the directors of the legal entity to an appointed signatory who will sign the deed on the legal entity's behalf. Name of the company: Must be 3 words long, no foreign words permitted. Share allocation of the shareholders. Paid up capital and authorized capital amount (minimum paid up capital of IDR 500,000,000, if the company will be required to hire expatriates). The company needs a minimum of 1 director (can be foreign or local), as well as one commissioner (must be local), for both these individuals a copy of their passport will be required. Director does not need to be a shareholder. For greater ease in forming bank accounts we recommend at least one local director, although strictly speaking this is not required. Please note that there are various levels of PT PMDNs (small, medium, and large) that have different rules and regulations attached to them. For instance, only medium sized PTs (defined as having a paid-up capital of at least IDR 500,000,000) can hire expatriates. Furthermore, there are some business segments which are closed to small or medium sized PT’s. Unlike PT PMA’s, local companies can register for KBLI’s (lines of business) during the formation process. This is one of the major advantages of pursuing a local nominee held PT PMDN structure. No matter which structure you choose to pursue as you launch a business in Indonesia, Permitindo can assist you throughout the whole process. Please reach out to us via e-mail at joe@permitindo.com or by submitting a form at www.permitindo.com. We’d be happy to consult with you about your plans and answer any questions or concerns you may have. We look forward to helping you expand into Indonesia!